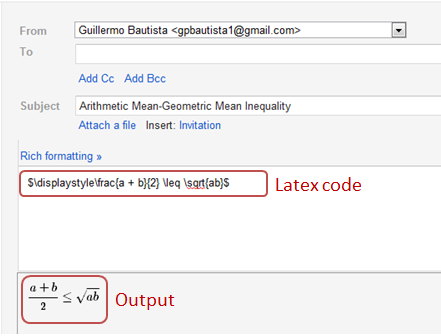 To all math enthusiasts who are using Gmail, you can now use latex code to render mathematical expressions/equations in your email. All you have to do is to install the GmailTeX plugin. Note: The inequality sign in the figure should be instead of . GmailTex is available as extension in Google Chrome (the browser I’m using). It also works in the following browsers: Mozilla Firefox (version 3.6 and later), Opera, Safari (version 5), and Microsoft Internet Explorer (version 9). For the details on installation and usage click here or the link above.